Within the framework of the CEPF funded Act4Drin project aiming at raising public awareness, enhancing knowledge and empowering NGOs to protect and conserve freshwater ecosystems in the Drin River Basin, a survey was carried out aiming to shed light on the prevailing public views and perceptions towards freshwater ecosystems in the Drin River Basin. 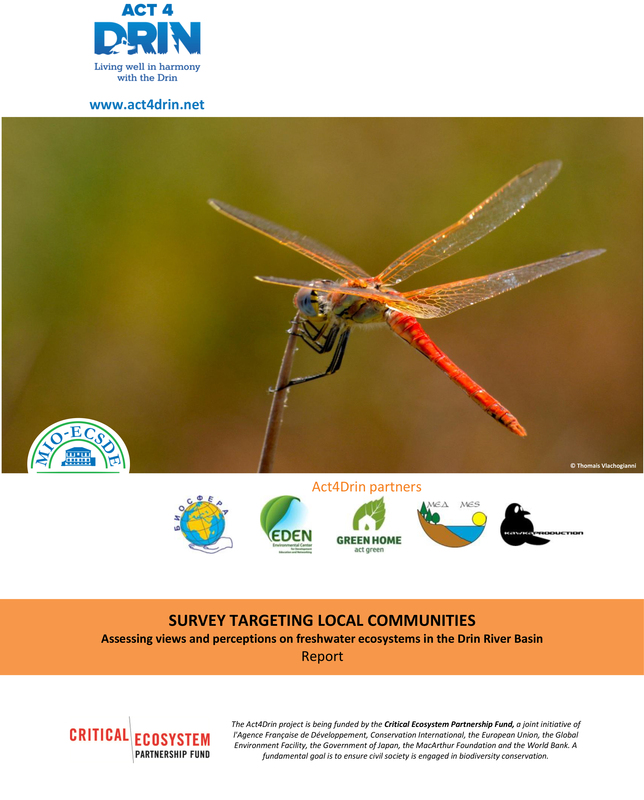 This survey was prepared by MIO-ECSDE and was a pre-assignment of the Act4Drin Spring School 2016, organized by MIO-ECSDE in collaboration and with the support of BIOSFERA, EDEN, MES, GREENHOME, GRASHNICHA, PPNEA, PROGEO, SOCA TRIPS and the University of Tirana, under the auspices of the University of Korca. Some twenty six bright natural sciences students from the Drin Riparian countries, namely Albania, Former Yugoslav Republic of Macedonia, Montenegro and Greece ran the 2-week survey from 22 April to 6 May 2016, targeting mainly the local communities of the Drin River Basin. A total of 314 questionnaires were filled in out of the 390 targeted respondents (~81% response rate), mostly through direct interviews in person or over the phone. 48% of the interviewees came from Albania, 26% from the Former Yugoslav Republic of Macedonia, 22% from Montenegro and 4% from Greece. The number of respondents from each country was inevitably dependent on the number of Act4Drin Spring School students from each country. It was revealing to see that a considerable percentage of the respondents (23%) was not aware that the Drin River Basin is a transboundary system. Furthermore, slightly less than half of the respondents (46%) didn’t know that the extended Drin River Basin has been acknowledged as an important freshwater biodiversity hotspot in Europe. For the big majority of the respondents the decline and possible extinction of animal species, flora and fauna, natural habitats and ecosystems is considered as a serious or a fairly serious problem at Drin Basin level, but also at national, European and international level. This overwhelming concern is in line with the urgent need for action. Regarding the importance of protecting the extended Drin River Basin it was reassuring to see that the vast majority of the respondents (~ 85-90%) strongly believes that we have a responsibility to look after nature, that our wellbeing and quality of life is based upon nature and biodiversity, that the area is indispensable for the production of goods, that nature is essential in tackling climate change and that nature is important for our long-term economic development. Interestingly though, some 15% of the respondents perceived the importance of the basin for goods provision and economic development as low. When it comes to the pressures that threaten the Drin River Basin and the ecosystem services it provides, some 60% of the interviewees identified water pollution by wastewater discharges and pesticides as the most prominent ones, closely followed by intensive forestry & deforestation (50%), over-fishing and water pollution by solid waste. The pressures considered as the least threatening ones by considerable percentage of the respondents (30-40%) included intensive farming and introduction of invasive species. When it comes to promoting research on the consequences of the basin’s degradation there was a considerable percentage of respondents (~13%) that regarded this measure as less imminent. It may be that most people feel that enough information and data already exists to support immediate actions. Last, but not least, it was very revealing to see that when it comes to personal actions the respondents are willing to undertake the protection of the Drin River Basin. The big majority (~90%) claims that they always or often respect nature protection rules that apply in the basin.